Here’s some video from SNY showing the Mets excellent tribute to Gary Carter on opening day 2012. The team did a great job bringing in Carter’s widow and kids for the tribute. They have a “Kid 8” patch on their sleeves this year and an image of the patch on the outfield wall. Carter’s family all threw out the first pitch of the game as well. The Mets did a great job with the tribute to Carter. Check out the video below. The Mets sent out a picture on Twitter of the patch they’ll be wearing this season in memory of Hall of Fame catcher Gary Carter who passed away last week. It’s the second patch the Mets uniforms will have this season. The 2012 uniform will also have a patch celebrating 50 years of the Mets franchise. Of course, much of the team’s marketing this season appears to revolve around the anniversary. Clearly, the Mets are doing the right thing by honoring Carter. I haven’t talked to anyone that disagrees with that. He was a huge part of one of the Mets most memorable teams in 1986. The Mets occasionally appear out of touch with Mets fans but on Gary Carter they seem to be doing all the right things. And you have to give them credit for that. I’m the first one to write about the Mets when they’re oblivious to the fans or team history. So I want to make sure that I note that they’ve done the right thing by recognizing the significance that Carter played in the history of the Mets. Here’s a good video summarizing Gary Cater’s career highlights from the Associated Press. ESPN’s Tim Kurkjian did a nice video tribute to Gary Carter that’s worth posting. 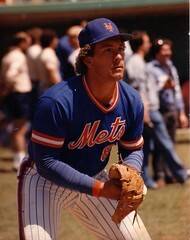 In December 1984 I remember being shocked that the Mets could trade for a player as great as Gary Carter. The Expos got Hubie Brooks, Herm Winningham, Mike Fitzgerald, and Floyd Youmans in return. But Carter was great! I remember wondering why the Expos would trade a player of Carter’s caliber. He was a seven time All-Star in 10 seasons with the Expos. It still surprises me to this day. In his 15 Major League seasons he made $13.3 million. He’d make more than that in ONE season if he was playing now. The 2003 Hall of Fame inductee and 1986 World Series champion passed away today at age 57 from brain cancer. Sadly, many media outlets had obituaries ready to publish today. Carter was in tough shape recently so it shouldn’t come as a surprise. But writing an obituary before some dies seems so disturbing to me. Here’s some audio of Darryl Strawberry with Mike Francesa on WFAN today. You won’t be forgotten Kid. ESPN’s Mike and Mike video interview with Kid Carter trying to explain his comments that appeared to be lobbying for Willie Randolph’s job. It might not be his job for long, but it sure is bad form to publicly posture to be the next manager of the New York Mets. Thanks to Awful Announcing for the great find.